Planning your next trip to the area where your ancestors lived 1,000 to 20,000 years ago may be magical; it was for me. Let me explain. Off and on for the last 20 years I have been doing serious research into my ancestral tree. We are family of unique characters and since my childhood, I have wondered why we were different or should I say a little out of the ordinary. Some background information is in order; my father's family was from New Roads, Louisiana, a thriving area of the plantation South in the 1800's. Originally, the family immigrated from Montreal, Canada in the mid-1800's. My mother is from Berlin, Germany. She came to the States after World War II to marry my father whom she met after the war while he was involved with post-war athletic activities sponsored by the US Army. My young childhood was influenced, heavily, by my German grandmother, who was my frequent babysitter while my parents worked hard building a new, innovative business, Alvin Roy's Strength and Slenderizing Salon. Many people in Baton Rouge may remember his establishment. My father was a handsome, charismatic entrepreneur who believed passionately that he could change peoples' lives for the better by showing them how to exercise. He is considered the "pioneer" of the strength and conditioning coach profession. Sadly, I lost the influence of my mother and grandparents in elementary school due to divorce. This fact led to many unanswered questions about my German background as I matured. Shortly after my father's death in 1979 and maybe because I was missing him so much, I began to do some genealogical research on the Roy family. We were never close to my extended family and I was curious about who my ancestors were. I contacted a local genealogist and she dug up a lot of information. She traced the family back to Joigny, France, a town about 100 miles southeast of Paris. My great-grandfather many times removed was the infamous Antoine Roy who came to Canada as part of a French regiment to help secure Canada for the French crown. He married one of the "Kings Daughters," Marie Major, an orphan from the Normandy region. You can still read about his travails on the internet and a book has been written about Marie Major's life, all fascinating to me that their legacies are well-documented. Delving into my mother's family tree was much harder because many of the records were written in an old German script which forced me to hire a German genealogist to get anywhere with this research. Nothing startling was found in my mother's family except for the several, rumored Jewish entries into the ancestral tree which I was interested in proving existed. The genealogist traced this side of the family back to late 1700's. In 2010 while researching for a trip on the National Geographic website, I noticed that NG was promoting a research project known as "The Genographic Project," a scientific endeavor where you could submit your DNA sample and subsequently, National Geographic would send you back a map showing where your family first originated in Africa and the ancestral migratory path they took through the ages. Once again, I was fascinated and sent off for the testing kit. What is the Genographic Project? The Genographic Project is a scientific research initiative headed by Dr. Spenser Wells that documents where mankind originated and how we populated the Earth using DNA samples received from people all over the world. To date more than 970,000 people have participated. Anonymously, you submit a cheek swab to NG in a pre-packaged kit and their scientists analyze over 150,000 DNA markers to document who you are genetically and your ancestral migratory path out of Africa. Women's DNA, mitochondrial DNA, is transferred down through the generations only through the female line and men's Y chromosome DNA is likewise, only transferred through the male family line. We get our genetic make up from both parents but our DNA code is only passed down from mother to daughter for females and from father to son in males. A quote from The Genographic Project's literature states, " The common direct maternal ancestor to all women alive today was born in East Africa around 180,000 years ago.” Dubbed "Mitochondrial Eve" by the popular press, she represents the root of the human family tree. Eve gave rise to two descendant lineages known as L0 and L1,2,3,4,5,6, characterized by a different set of genetic mutations their members carry. Since I was only interested in mitochondrial DNA, I will forgo writing about paternal DNA and the Y chromosome data bank. The first test I took revealed my halo group was H with a mitochondrial sequence of HVRI. In the photo you will see the route my matriarchal relatives took out of Africa in red. What struck me was the route that was taken once they left the Middle East. It followed the western coast of the Caspian Sea and went through Russia for almost half of the journey until they turned west and migrated into northern Germany. I was amazed it went right through Berlin. Genetic science was "right on." In 2013 the test was refined to be more specific; so of course I took it again. I wanted to know if it would have the same results and what new information it would reveal. In second test the route was similar but not exactly the same. The results showed that much of my family's migration was again through Russia but the path to Germany was south of Berlin in the Wendish region where I knew some of my relatives had lived. My new mt DNA sequence was more specific, H1a3a. The second test also revealed additional information about the genetic make up I inherited from both parents. I am 40% Northern European, 42% Mediterranean, 16% Southwest Asian, 1.8% Denisovan and 0.9% Neanderthal. The last two are cave women strains!! Right on again, Northern European from my maternal side and Mediterranean from my father's French ancestors and I guess the Southwest Asian was inherited from both sides?? The last photo shows where most of the people in the world who share my mtDNA live. These are the areas in yellowish orange. Once again, most of the females who share my mt DNA currently, live in Russia, next, in northern Germany, the Baltic states and in Scandinavia. What does all of this mean to you and travel planning? Have you ever visited a country and wondered why you like it so much? Why you feel a deep familiarity? Why you are comfortable with the people and the place and don't have a rational explanation for this feeling. It's a kind of a subtle "déjà vu" I experienced these feelings every time I traveled to France and Germany but I really had the "Ah ha" moment when I went to Russia for the first time. The "fleeting" thought passed through my mind; maybe the reason I like Russia so much is because one third of my female relatives migrated through this area of the world some 1,000 to 10,000 years ago. Maybe the "Russian soul" is in my DNA?! Correspondingly, I loved everything about Russia; the architecture, the visual and the performing arts, especially, the Bolshoi ballet, the food and most importantly, the women. I found them to have a cool exterior on first meeting but once they observed you for a short while and where comfortable with you, they revealed themselves. In general, Russian women are stylish, strong, disciplined, and determined, possessing great stamina. Family is the most important thing in their lives and friendships are lifelong. On my first trip to Russia, one of my VIP guides, Irina Orlova, and I instantly bonded and have become good friends. She will be helping me build my Astrid Solo Travel Advisor brand in Russia. In planning your next trip, consider traveling to the countries where your ancient ancestors lived and roamed. My future travel plans will definitely include trips to Africa, Egypt, Jordan, Azerbaijan, a river cruise up the Volga river from Astrakan and additional, extended trips to Poland and the Scandinavian countries. I am curious as to whether I will like these countries as much as I did Russia. 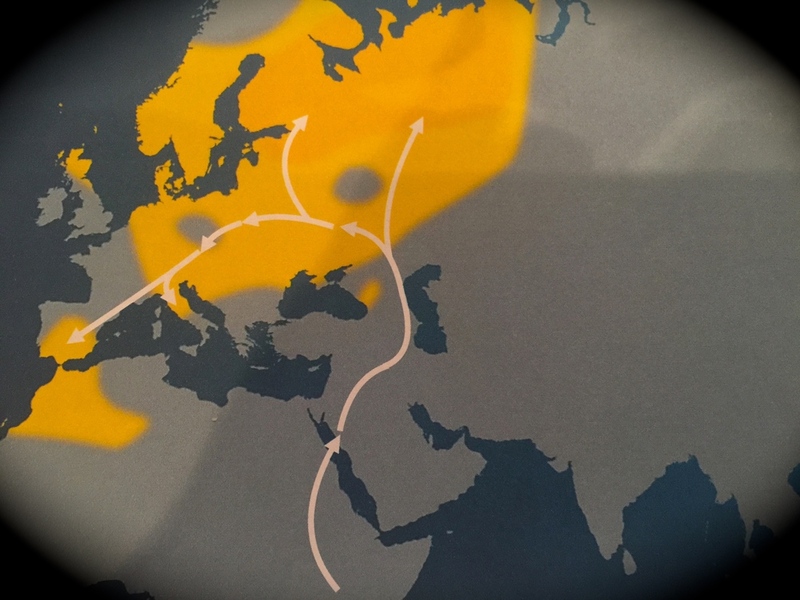 For those of you interested in delving deeper into your ancestral roots than just basic genealogical research, I strongly recommend the Genographic Project. Order the Geno 2.0 DNA testing kit, submit you cheek swab and find out who you are and the path of your ancestral migration through the centuries. The following is a short video explaining the The Genographic Project. I would love to hear your feedback on this post; nothing like "out of the box" trip planning ideas! Follow Astrid Solo Travel Advisor on social media for more affordable luxury solo travel tips, tricks, stories and advice. Click on the links below!